This time last year there was a lot of hype around Twitter. It seemed to die down a bit, but it has recently felt like Twitter is getting a second wind and properly coming into the mainstream. Twitter do not publish official figures on number of users or regularity of updates, so there is no hard data to back up my opinion, however the Twitter Facts blog have looked at this recently and the stats they have found seem to agree. Twitter is a great way of generating feeds and a number of publishers are using it to connect with readers and highlight particular stories / discussions. US news organisations like CNN and the New York Times have used Twitter for a while, but more recently British publishers have started experimenting with Twitter. 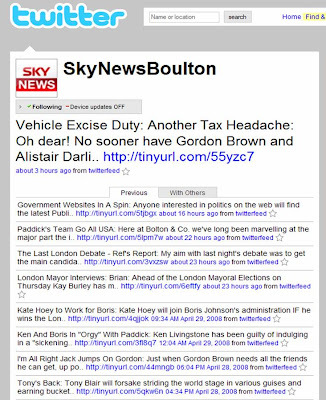 SkyNewsBoulton or GordonM (editor of Brand Republic) are good examples of how Twitter is being used to draw attention to particular articles, whilst creating a deeper engagement with viewers / readers. The most followed Twitterer is Barack Obama with over 25,000 people following him on Twitter. In the UK London Mayor candidates Boris Johnson (http://www.twitter.com/backboris) and Brian Paddick (http://www.twitter.com/brianpaddick) have also been experimenting with Twitter to let voters know what they are doing and Downing Street (http://twitter.com/downingstreet) now have a Twitter account that they regularly update to show Gordon Brown's activity. The use of social media in politics is growing and micro-blogging politicians is an interesting development. Twitter.com has not accepted display advertising, but in Japan (where it has just launched a Japanese language version) Twitter.jp has decided to accept homepage advertising. "One of the first advertisers is Toyota which has a Twitter account where they talk about events and products. 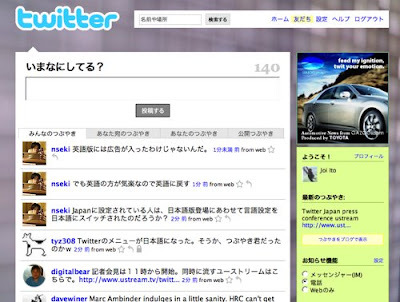 The [Toyota homepage display] ad directs people to a Toyota Twitter account where the users can follow the brand. Toyota can easily see who their fans are and follow what their fans are saying about them." Twitter is now being used for spamming with a number of Twitter users starting to complain about Twitter spam. The default setting on Twitter allows anyone to start following you at any time. Twitter spam involves becoming a follower of a large number of Twitterers in a very short space of time (often thousands in a few hours.) The hope of the Twitter spammers is that users that they have added as followers will either reciprocate and start following them, or at least look at the website listed on their profile. The only way of preventing Twitter spam is to change the Twitter settings so that you have to personally approve each new follower, but this can be time consuming and feels against the spirit of an open community. However, the development of Twitter spam is a good indicator that Twitter is now properly established! There are now a large range of Twitter applications resulting from Twitter's opening of their API. 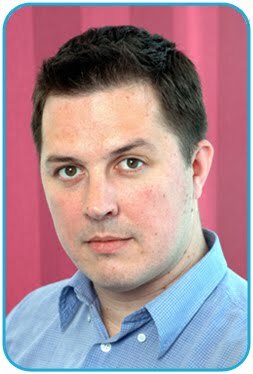 Twitterers can update their Facebook status with their Tweets and various applications like Tweetscan (http://tweetscan.com/alerts.php) allow scanning of Tweets or Twitter tracking. Twitter is also popular component of Mashups and initiatives like Twittervision (http://twittervision.com) or Twittearth (http://twittearth.com) give interesting perspectives. 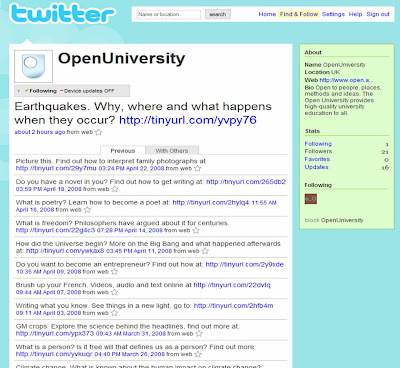 There is even a desktop application called Twhirl (http://www.twhirl.org/) that allows Twitter to be updated from Twitterers desktops. The most talked about Twitter application currently though is Twistori, a beautifully designed application that allows people to follow Twitter updates around Love, Hate, Think, Believe, Feel and Wish. 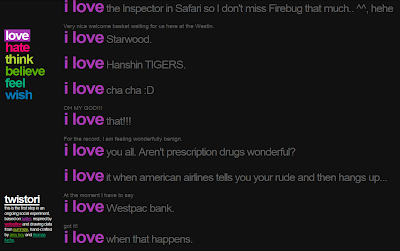 A number of Twitterers seem to be experimenting with Twitter projects. There doesn't seem to be any real objective to the majority of these other than curiosity and an interest in seeing what happens. 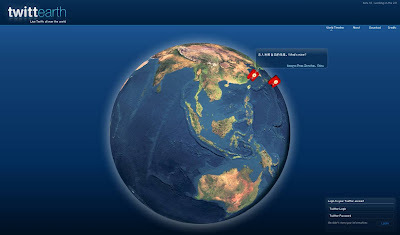 A good example of this is Inwotr (http://www.twitter.com/inwotr / http://www.inwotr.com) where a Twitter user is trying to virtually travel the world through connections made through Twitter! Twitter seems to be reaching critical mass and whilst commentators have long been predicting that Twitter will be the next big thing, I think the above examples are good indicators that Twitter will soon be properly established in the mainstream. Interested to hear of any other examples. I didn't follow the DowningSt Twitter for long as they were updating it too often and it all got a bit much - they are still following me though! Also if Gordon Brown loses the next election do you think they'll handover all the passwords for DowningSt social media properties to the new administration?